Size of this preview: 391 × 599 pixels. Other resolutions: 156 × 240 pixels | 783 × 1,200 pixels. 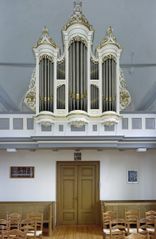 Interior and organ in the Doopsgezinde Kerk, Ytens. current 07:50, 29 September 2014 783 × 1,200 (144 KB) RichardThiessen (talk | contribs) Interior and organ in the Doopsgezinde Kerk, Ytens.<br /> Photo by Paul van Galen and Kris Roderburg.<br /> Source: [http://commons.wikimedia.org/wiki/File:Interieur,_aanzicht_orgel,_orgelnummer_746_-_Itens_-_20417516_-_RCE.jpg Wikimedia Commons]. This page was last modified on 29 September 2014, at 07:50.